That’s important to keep me spry and maintain my sanity. In three hours there were eleven political phone calls to the house. I could tell they were political because no one ever calls the house phone and none of them had a Caller ID that made any sense. Usually there’s the ever popular “Unknown Caller”. Hiding like that doesn’t work. Lots of people don’t answer them either and the dirty little secret is it really skews the results. Occasionally I do pick up, just so I can have a conversation with the person at the other end about being sneaky. Major political races usually hire a polling company. So smaller races or cheap candidates use friends, family, people pulled off the street. Having been in the political heap for a bunch of years, I may be considered an expert on these election things. 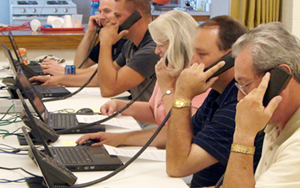 I can tell you most of those calls during dinner time come from a phone bank of volunteers. “Volunteer” as used in the context of “being volunteered”. 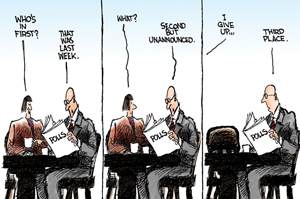 Usually it’s a political appointee assigned to making poll calls. “I’m sorry sir, ‘neither’ is not an answer on my list to check off. In the back of your mind you know you better make those calls if you want to keep your appointee job in case the candidate wins. I hated that and usually weaseled my way out of it. You’re handed a list of random phone numbers from a certain district. That’s how they can call you even if your number is unlisted. They’re just dialing random numbers. You hope no one answers so you can get through your many page assigned list quickly and go back to something fun. Sometimes they call from home. Sometimes from their cell while at the beach having a brew. Sometimes from a bank of phones at a friendly lawyer or travel agency office. The typical shift is around four hours. After about an hour of this you really wish the people wouldn’t chat with you and explain why they plan to vote a certain way. You really, really don’t care. Just answer yes or no or pick one from the list I’m going to read to you. Sorry I’m interrupting your dinner. I’m sitting here eating two-day old donuts and some moldy stuff left on the table. I gotta pee, I wanna go home, and a have a ton of work waiting for me back at the office. Getting out of there after your shift feels great. Then you remember you have to be back the next night.